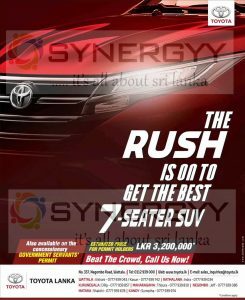 Toyoto Lanka announces their update price for Toyota Rush 2018 7 Seater SUV model as Rs. 3.20 Million for Permit Holders. Toyota Rush is well known as compact SUV model for a small family for long term use, with the extended seating capacity added more value to Sri Lankan families.